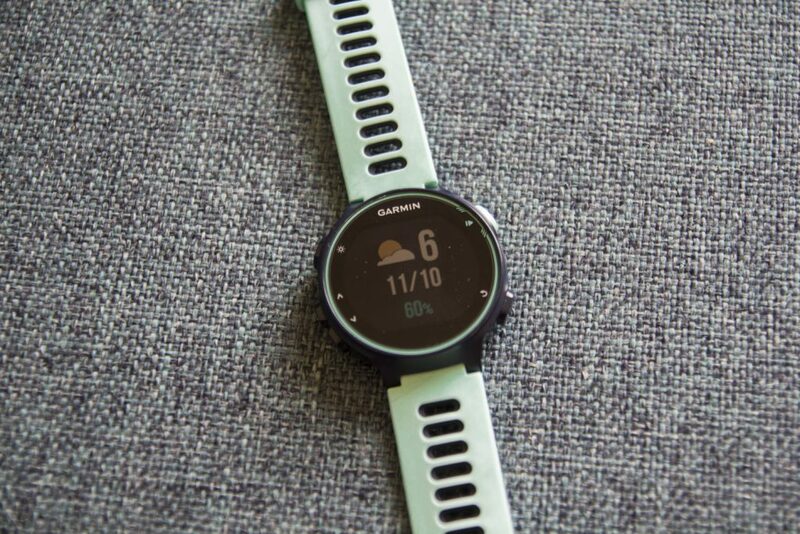 Newly released this year, the Garmin Forerunner 735XT watch packs a whole heap of functions into an attractive package. The watch is squarely aimed at Triathletes and though I’m not one and have no pressing plans to try one, I drawn to the multi-sport functions having become rather taken with swimming during my Speedo Pedal To Pool challenge. I’m not currently doing much running but for the purposes of testing the watch and trying out my new trainers, I’ve done a few runs, and naturally, I’ve done heaps of cycling alongside my swimming. 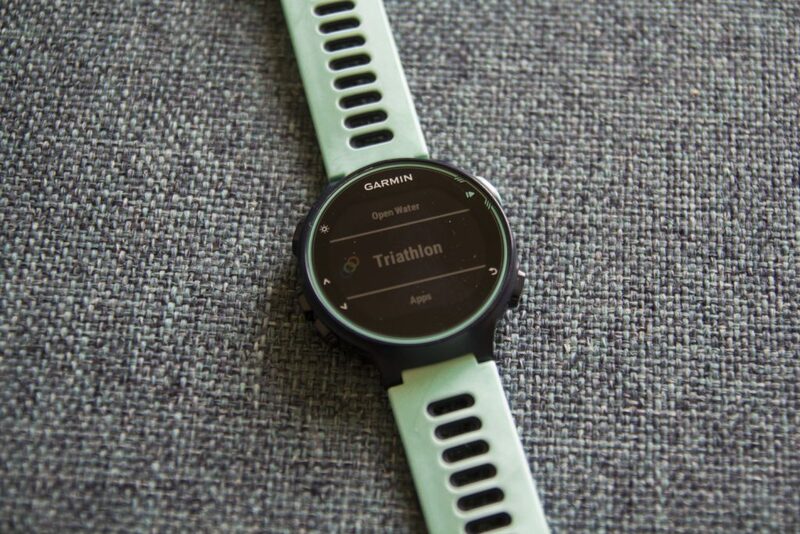 The watch records data from all variations of these three activities, so indoor and outdoor running and cycling as well as pool and open water swims. As it’s a triathlon watch, you can also record multiple sports in one activity, so say I was doing a triathlon, I could log all the elements as one race but analyse them individually. You can also record gym workouts other activities such as cross-country skiing and paddle boarding, rowing and hiking. I opted for the cheerful looking aquamarine version (Frost Blue). It’s also available in black but doesn’t look as good if you ask me. It’s a sporty looking number made of soft rubber so if you like to look athletic this will fit nicely with your day to day wardrobe – less so if you plan on wearing a dress to the office or whatnot. Big buttons are easy to use even with cold hands. It’s lightweight and comfortable to wear. The face is large, shiny and chunky – about 4cm across so it pretty much covers my entire wrist and it’s near enough a centimetre deep. The display is bright and clear. The watch face display can be customised to look how you like, by downloading different faces through the IQ store. Around the back, you’ve an Optical heart rate sensor which is how it picks up and records your heart beat. You have to ensure the strap is fairly snug to do that, more so when exercising than the rest of the time. 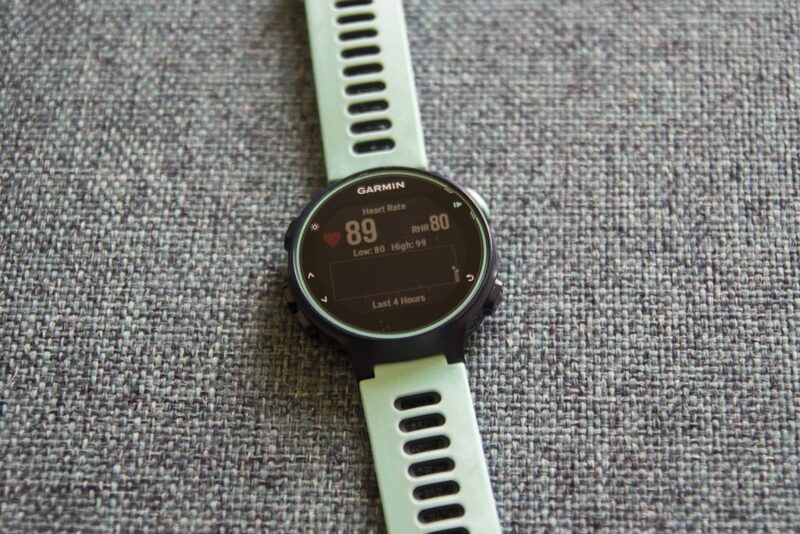 The watch itself isn’t tricky to set up, however you do need to pair it with Garmin Connect which can be temperamental, to say the least. Let’s just say, I hope I never have to do that again. In theory it should only take several minutes. This watch has so many features it’s mind boggling, so I’ll just get on with listing a few of them. At its most basic, it’s step counter/fitness tracker, then it (roughly) records your heart rate throughout the day, which I find interesting as my resting heart rate gives a good indication of how recovered I am from my training. It’s best to use this HR data a general guide though rather than expecting pinpoint accuracy – it doesn’t check your heart rate very often when you’re inactive, so unlike a Fitbit you’re not actually getting truly continuos HR data. You can also display your HR for the last four hours and then scroll though to see your average resting HR for the last 7 days. I wouldn’t pay too much attention to that though as it got mine way off – mine’s low but not 32BPM low! As the watch doesn’t have a barometric altimeter it doesn’t record stairs climbed. It does record steps and displays your activity levels for the day, though for some reason it doesn’t factor your cycling/swimming/other activities into the total calories burned. It also records sleep, though I’m not convinced it’s that accurate as my true resting HR is so low it probably thinkings I’m sleeping when I’m just reading in bed. The connectivity features are really cool – if you pair it with your phone (using Bluetooth) you can have your texts and Facebook messages appear on the screen and you can answer phone calls – you’ll still need your phone to reply but I find it useful to press ‘answer’ on my watch whilst I rummage about in my bag for my phone. It can display events from your calendar and the current weather. You can also pair it with your Garmin Vector pedals or Shimano Di2 groupset, all of which makes me feel like I’m living in the future. Just click record and you’re off – simple. When training on the bike, I tend to prefer a bar mounted unit as it can be tricky to see your wrist but for times when I don’t want to be glue to a screen looking at my data, the watch is great. I’ve recorded rides on the watch and my Garmin Edge 1000 for comparison and the data is not dissimilar. The watch is water resistant to 50m, which should be more than plenty. To use it in a pool, you need to select the correct pool length first, otherwise you’ll think you’re really fast, like I did when I forgot. Sadly, the Optical HR monitor on the watch doesn’t work underwater, so if you want to record HR data you’ll need to buy the swim hear rate monitor strap to wear on your torso. Regardless of that, the amount of data recorded is astonishing, showing in minute detail your every stroke. Lengths are counted each time you touch the end. I really enjoyed using the watch to record my length times, finding it really motivating as at the end of the swim, any Personal Bests or records you’ve beaten flash up on the screen. It’s not flawless – one day I got out of the pool and my time indicated a new World Record and occasionally it might get the number of lengths slightly off, but overall, it’s good. I didn’t have much luck in the sea. The watch uses GPS (and/or Russia’s Glonass though using that drains your battery more quickly) to record distance and pace, so you need to wait for the GPS to kick in before you press record, then in order to work it does calculations that make up for the loss of GPS every time you dip your arm in the water to take a stroke. It sounds amazing but no matter how many times I tried, I couldn’t get the watch to record my open water swim properly and I tried heaps of times. I’ve read other reviews that say the watch is 95% accurate at recording open water swims, so I’m not sure what the problem was. I don’t run a lot (yet!) so I tended to use this watch in it’s most basic way, simply to record. Back at home when you upload the data there’s heaps of interesting stuff to analyse such as stride length and split times. Out on the road or the trails, you can use a metronome to regulate/optimise your cadence, which sounds cool but its too advanced for me. I stuck to using the lap, interval and timer modes and looking at the map of my laps on Strava afterwards, I could see the Forerunner’s GPS had accurately pinpointed my whereabouts. Using the watch as just a watch, you can expect about 10 days battery life. 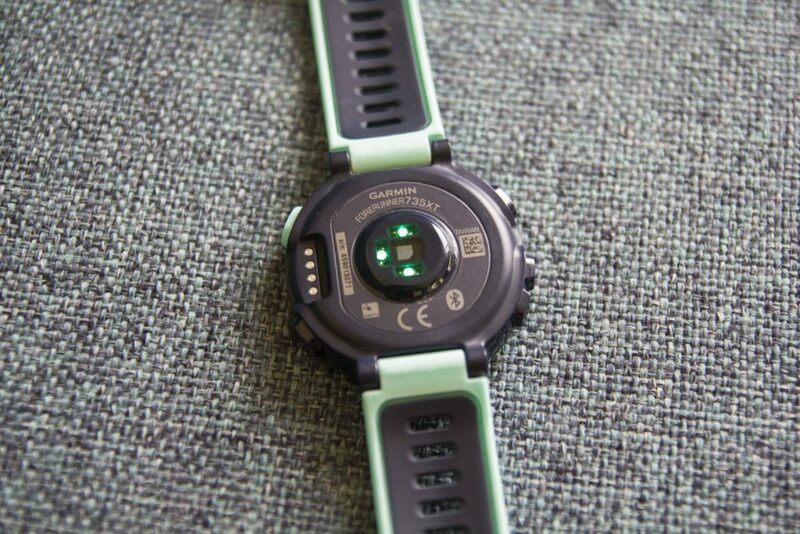 Using it with GPS, optical heart rate monitor and all that malarky and you’re looking at around 14 hours, but it does depend on what other sensors you attach – say you added your power meter, that would drain it more quickly. Charging is simple using the USB cable. It’s not perfect but I knew how much I liked this watch by my panic and despair when I thought I’d lost it. It’s fun to use and if you’re a data freak like me, you’ll enjoy recording everything you do and looking back at it. The Personal Record notifications are fun and motivating, it’s simple and intuitive to use and I like the way it looks. On the negative side, it can be inaccurate in the normal day-to-day (rather than activity recording) mode and I couldn’t get the open water swim to work. 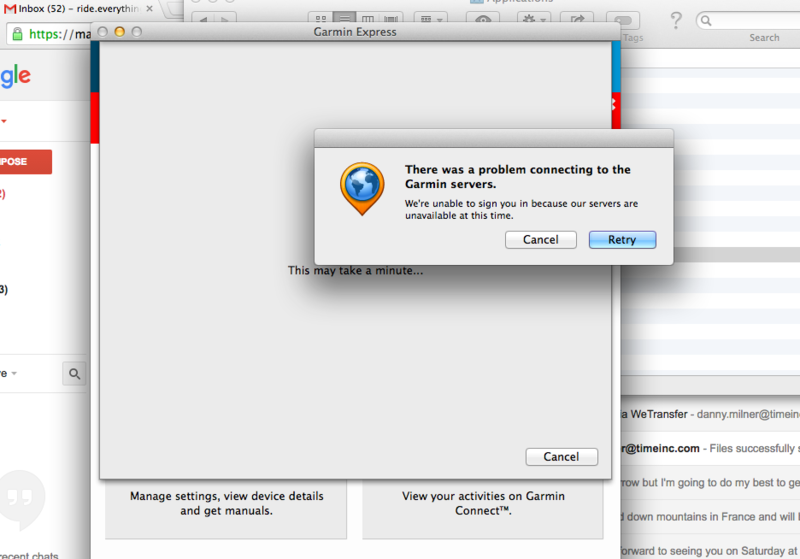 Speaking of using GPS Garmin is the best for me. Almost 100% accurate in providing coordinates data and location.